What does each team need to do to win? 1. 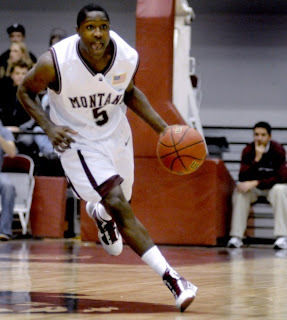 Get the big guys involved – Montana’s offense is helped when guys like Mathias Ward and Derek Selvig are a part of things offensively, because both have varied offensive games. They can create space with their outside shot, which opens up the lane for Will Cherry and Kareem Jamar. Another big thing is that EWU’s big are prone to foul the opposition, which makes it even more important for Selvig and Ward to be aggressive. Ward had his best game of the season in these team’s first matchup, scoring 28 points in a victory. 2. Go right at Eastern Washington’s defense – As mentioned, Eastern Washington has put their opponents on the free throw line more than anyone else this year, which makes it imperative for the opposition not to settle for jumpers. This is part of the reason that Idaho State lost to EWU three times… they didn’t try to force anything or get to the line, and they were content to shoot jumpshots. That is not the best way to take down the Eagles. 3. Guard everyone on the perimeter – EWU is not afraid to shoot from the perimeter, and just about everyone (except Laron Griffin) will fire away at any time. You have to make sure to guard them at all times, because if they get hot from there they can beat anyone. It is probably preferable to let guys like Cliff Colimon, Collin Chiverton, and Parker Kelly drive rather than get an open look, which Montana has to watch for. 1. Get Kyle Tresnak involved early – Everybody knows what Damian Lillard and Scott Bamforth can do offensively, but a big key for the Wildcats is Kyle Tresnak. He has shown himself to be one of the best scoring big men in the Big Sky, as long as he is getting touches and staying out of foul trouble (which derailed him against Montana). He has a nice baby hook and low post game, and should have a size advantage over most PSU guys (except Nate Lozeau). It will be key to get him involved. 2. Stay aggressive – Against Montana, they were content to launch deep threes against Montana’s zone, and I am sure PSU will see this on tape. It won’t be a surprise if the Vikings play a lot of zone defense, and if that’s the case, Weber State needs to stay aggressive. Work to get the ball inside, take the ball to the basket, and push it in transition. 3. Keep Portland State out of the paint – The Vikings are an efficient offensive team because they are so good at taking good shots. Charles Odum is one of the best in the conference at getting in the paint, and shoots a great percentage because of it. Chehales Tapscott and Renado Parker are great inside, using crafty moves to score points. If you can make PSU beat you from the outside, chances are that they won’t beat you. 1. Keep Damian Lillard in check – In two games against PSU this year, Lillard has averaged almost 40 points per game, and has absolutely dominated both games. Obviously, that can’t happen again if the Vikings want to pull the upset. While WSU has other players that are very capable offensively (Bamforth, Tresnak, Bullinger), Portland State would be wise to make those guys beat them. Certainly this is easier said than done. 2. Hit some outside shots – Their offense is predicated on getting into the paint, but to be a very good team they need to be able to keep defenses honest. Charles Odum, Lateef McMullan, and Michael Harthun all need to hit a couple shots from the outside, which will open up their lanes to drive to the basket or get better shots for Chehales Tapscott and Renado Parker. If they can hit from the outside, they are tough to stop. 3. 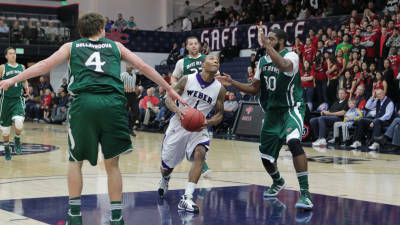 Hit the offensive glass – This is a way for them to get some easy baskets, which will be needed to keep up with Weber’s offense. Chehales Tapscott is a solid offensive rebounder, and had some very nice putbacks in their game against Montana State. This would relieve some pressure on their halfcourt offense if they are able to get some second half points. 1. 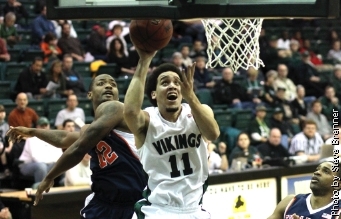 Get some contributions from Collin Chiverton – He won the Big Sky Newcomer of the Year award, but he has been battling some inconsistency and injuries all season long. When he is on, he is a deadly long-range shooter that can put up 20 points on you, as well as get some buckets in transition with his athleticism. When he is not on, he will take a lot of bad shots, and can be a ball-stopper in their offense. To beat an elite team like Montana, they need him to be the guy that was the top newcomer in the Big Sky, and not the one that has scored 12 points in their last four games. That might depend on his health. 2. Take care of the ball – This has been a strength for the Eagles all year, but will be especially important against Will Cherry and Montana. Montana can rack up easy points off turnovers (especially out of their 1-2-2 zone press), and that’s why it’s key for EWU. It is hard enough to beat the Grizzlies even if you are not giving them easy points. 3. Stop Will Cherry’s penetration – Cherry is one of the best penetrators in the conference, and has great quickness going to the basket. This can get good looks either for himself or his teammates. 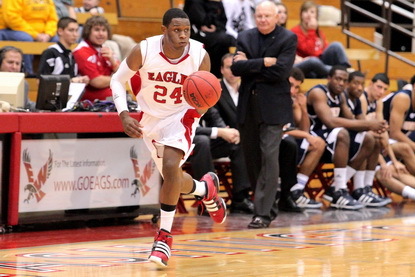 EWU needs to cut that off at the point of attack, and make him be more of a jump shooter. Even though he has improved in that aspect, it is a better proposition than allowing him to get into the lane. Any other keys for the games? For any live updates or discussion during the games tomorrow, make sure to follow me on Twitter.